Learning disabilities and failure to read put huge financial strain on this country. Over fifty percent of our prisons are filled with dyslexic people. The state of Arizona looks at the number of kids who can’t read in 4th grade to plan for their future prison population. 85% of juvenile offenders have reading issues, and about $2 billion per year is spent on kids repeating grades because of reading problems. Let’s face it, illiterate people are the ones who end up living on the taxpayer dime. President George Bush’s signature legislation “No Child Left Behind” (NCLB) now referred to as ESEA is up for reauthorization. The legislature is moving fast to make changes. When NCLB was first passed I was one of its biggest critics. Teachers started “teaching to the test” instead of teaching students. It seemed the art of teaching was being replaced with government oversight. I, along with many parents, had my doubts about whether this was a good idea or not. My disdain for NCLB changed when my child was one of those being left behind, despite all the testing. I started to see aspects of the school system I never knew existed. My daughter was smart enough to actually do well on the standardized tests, smart enough to get good grades, but I knew something was wrong. Then, I saw the school system at work. I saw the reason NCLB was such a needed law, even if it couldn’t help her specifically. My daughter is dyslexic, which is a learning disability pertaining to reading. The school never caught it. Surprisingly, even though dyslexia is a federally recognized learning disability, my state doesn’t even recognize it. How can you remediate something you don’t acknowledge? You can’t. As a result, kids are falling through the cracks all over the place. I went to the school on many occasions telling them my concerns, only to be assured she was on grade level. Like many dyslexic students, she is smart, very smart. This allows her to compensate for her inability to read fluently. On the state standardized test my daughter would score “proficient,’ even though her reading is two grade levels behind. How is this possible you ask? The Alliance for Excellence in Education found that the gap between the state reporting and federal reporting of proficiency can be as high as 40%. NCLB was a way to level set the reporting. As a parent you know from school to school, county to county, and state to state how a school is performing. When the states were responsible for testing, they inflated their performance, giving parents no clear picture of the school. I have watched the school handle my daughter, and children like her. The stories are all the same. The school system will do whatever they can to get the kids through. They pad the grades, fight any specialized testing that may uncover a learning disability, and are underequipped to remediate. I am convinced the only way these kids aren’t being left behind is because parents take their own money and privately test, tutor, and put their kids in expensive specialized schools. This isn’t an option for most American families. Testing for learning disabilities runs $1500-$3000, tutoring is $60-$100/hour, and school tuition for a dyslexic school can be as high as $30,000. A family’s financial status should not determine a child’s literacy, but today it does. NCLB was the first step in changing this by challenging the powerful teachers union, and grading the teachers, schools, and even the states regarding the effectiveness of their education programs. It put all children in all states on an even playing field. NCLB shined a light on these children so that the school system was accountable to help them progress. Technically, no longer could the school just pad the grades and pass them through. NCLB is up for reauthorization. The republicans want to strip out some of the most important elements of this law and literally “dumb it down.” One of the key changes in their proposal called the Student Success Act, is to take the accountability away from the federal government and put it back on the state. I understand from the conservative viewpoint why they would suggest this, but doing so would be a big mistake. States which have a very strong teachers union would lose accountability, states would once again inflate their performance, and many kids would be left behind once again. NCLB is not a perfect law, and admittedly needs improvement. This was the first time parents were able to look at their school and see how it matched with other schools in their state, and other schools in the nation. Failing schools could no longer hide and were forced to improve. NCLB was dream legislation for all kids with learning disabilities. They need to keep the great parts of that law that are working and instead focus on how we can remediate and bring these kids to the next level. President George Bush figured out a way to do what no one else has done, grade the schools. We need to build on his platform, not redesign it. The focus shouldn’t just be on finding kids who are behind, but intervening, so that they can have a successful future. 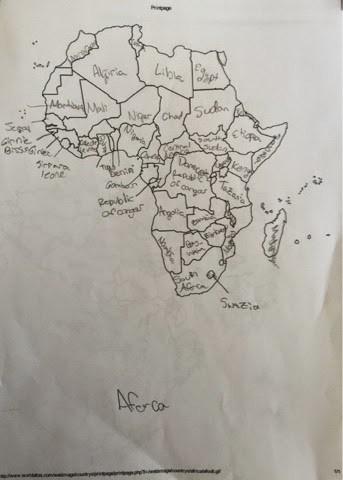 This map was filled in from memory by my daughter. It took her 5 minutes. Look at the spelling. This is dyslexia.